In the tradition of St. Francis of Assisi, some of our congregations offer special services where people are invited to bring their animal companions for a special blessing. Donations to help animals in our communities: Most of these events are encouraging people to bring items or give offerings that will be used for the welfare of animals, including local shelters. If you plan to attend, please check with the individual congregations to see how you can help. Pet safety: Many churches request that pets be on a leash or in a crate or carrier, please. All Saints, Hilton Head Island: 5:45 p.m. The blessing will be followed by light refreshments for all two- and four-footed attendees. Good Shepherd, Summerville: 10:00 service at the church. St. Catherine’s, Florence: 2:00 pm service with Cross and Crown Lutheran Church, 3123 W. Palmetto. Treats will be provided and a collection of pet food, supplies and monetary donations will be sent to Darlington Humane Society. St. Stephen,'s Charleston: 2:00 pm service at the church. Pets receive collar medallions and certificates. Treats available. The St. Stephen’s Choir will provide a song and refreshments will be served. St. Anne's, Conway: 3:00pm service at First United Methodist Church, 1001 5th Ave, Conway SC 29526. Donations will be collected to aid the many pets who have been stranded or abandoned due to the hurrricane and flooding. Grace Church Cathedral, Charleston: 4:00 pm service. Pets receive special collar tags; the children's choir will sing and light refreshments will be served. St. Mark's, Port Royal: 4:00 pm service at the church. St. Stephen's, North Myrtle Beach: 4:00 p.m. service at the church. Holy Cross Faith Memorial, Pawleys Island: 5:00 pm service at the church. 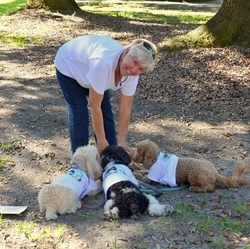 The Episcopal Church in Okatie: A joint Blesssing of the Animals will be held at 11:00 am along with the church's next-door neighbors, Noah’s Ark Rescue, which provides medical care for abused dogs and finds them loving homes. Looking for resources for planning a pet blessing? Check this page from the Episcopal Church Foundation.